Wednesday 17th August was a very big day in the lives of Cashel Community School class of 2017. Many students approach the schooled with both excitement and trepidation. Newly appointed Deputy Principal John Murray commented that “There is huge pressure on students with the exams and in many ways, some appeared more nervous today collecting their results than when they were doing their exams. But I suppose they are nervous because they know how hard they worked and they want their results to reflect that effort”. Furthermore, the class of 2017 received their Leaving Cert results have the added anxiety of mastering the new points system and its implications. Gone are A1s, B2s and C3s and, in their place, were H1s-H8s for higher-level subjects and O1s-O8s for ordinary-level subjects. Margaret Moore, Deputy Principal, said the school was very proud of all the students. “They have performed extremely well in their exams. The students and their teachers have worked very hard to get these results. We would like to wish them all the very best for next year,” she continued “We believe a balanced approach to academic performance and holistic education produces rounded, confident and disciplined young adults who can think for themselves and who are not afraid of a challenge. In a world that is changing all the time, faster and faster, those are valuable life skills indeed”. The Principal Mr. Gallagher said, “We will always hear about the highest achievers and this is reflected when the National Papers produce League tables. However they do not reflect the cohort of students attending various second level schools. We in Cashel Community School believe that success comes in many forms and the student body agreed that the results were a fair reflection on their work over the past five to six years. 11% of the student body attained 500 points or higher with a further 28% securing over 450 points. 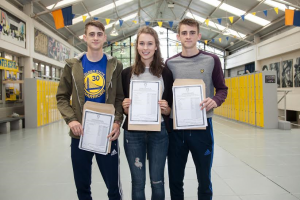 Whilst acknowledging the outstanding achievements of those pupils who scored very well in the Leaving Certificate, we also recognise and applaud the excellent achievements of the many students who fulfilled their true potential. As a result I am delighted with how all our students excelled in the Leaving Certificate; this is a great credit to the students, their parents and the whole school staff. It reflects the ethos of the education programme provided in Cashel Community School.” He wished the students the best of the future and thanked the dedicated staff of the school as well as the support of parents. Going forward I would advise students to consider all their options as they reflect on their Leaving Certificate results today. Most students are planning on accepting places for college while others are considering paths into training, apprenticeships or the world of work.